Happy 4th Day of Christmas! 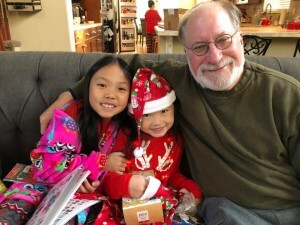 We got home from Denver last night, after spending five wonderful days with two of our “kids” and all four granddaughters, and the magic of a white Christmas. Being a city girl, it’s always fun for me to see the wildlife near our children’s homes… this time two coyotes and several rabbits. Our days were spent playing games (7 different games with the girls! ), watching football, eating (of course!) and catching up on the lives of our kids who live so far away. 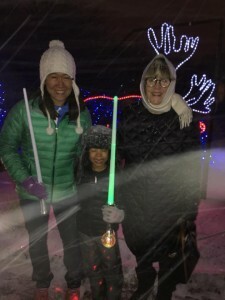 Every day was special, but a couple of special memories are the night we went to Zoo Lights with our daughter and her family… only to encounter a blizzard as we tried to walk through the beautiful sights! 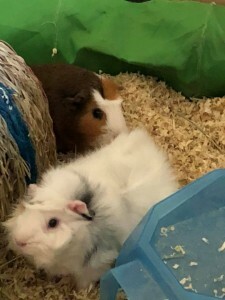 Another special memory was reading A Guinea Pig Nativity with our son’s daughters, and then playing with their Guinea pigs, Snowy, Noah, and Luke. 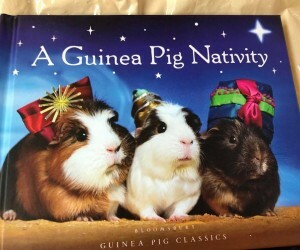 (This is a wonderful little book, even if your kids or grands don’t have Guinea pigs!) Here’s a hilarious You-Tube video of a live Guinea Pig Nativity play! My first gift from Jared! Oh, and exchanging gifts. I love presents… to give them and to receive them. And to watch our granddaughters spend hours enjoying their new toys and games. 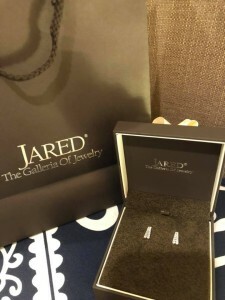 I was blessed to receive several really special things this year, including earrings from Jared, personalized stationery, personalized traveling jewelry case, Echo Dot for my office (we also have them in our bedroom and den), individual fondue mugs (I love chocolate fondue! ), and more. My daughter and daughter-in-law both know how much I love quotes. 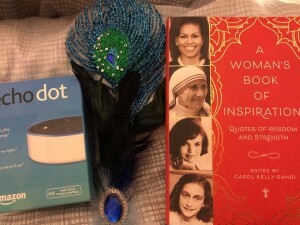 Beth (my daughter) gave me this wonderful book, A Woman’s Book of Inspiration: Quotes of Wisdom and Strength, edited by Carol Kelly-Gangi. 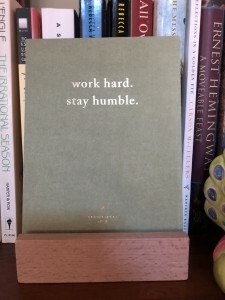 My daughter-in-law See gave me this little “Bright Ideas” set with a wooden stand and a collection of quotes you can change out on the stand. So I’m going to post some of the quotes they sent me from time to time here on my blog. Starting with today. 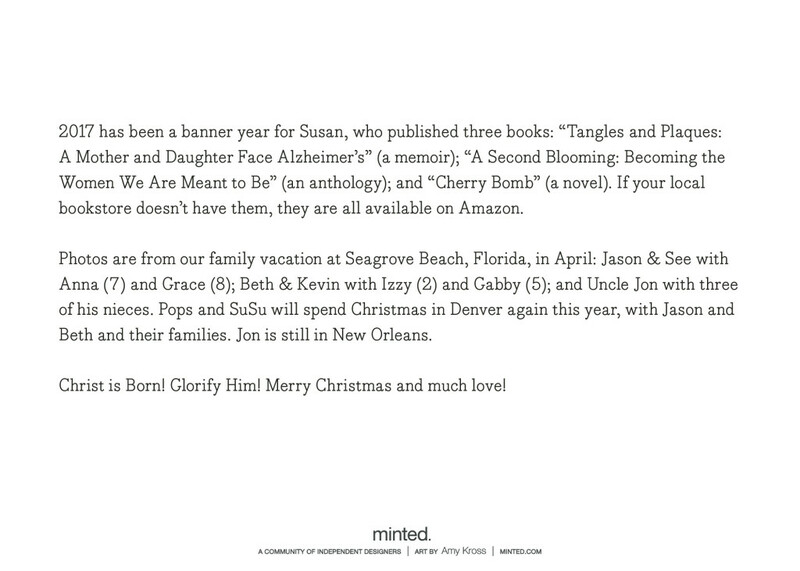 Thanks, always, for reading (even when I’m gone for a week during the holidays!) and remember that I love to hear from you, here or on Facebook or Twitter. Christmas Day at Beth Cushman Davis and Kevin Davis’s lovely new home, with their family and Jason and See Cushman and family. We’re off to Denver to spend Christmas with two of our three kids and their families (which includes our four granddaughters!) so no time to write a blog post this morning. 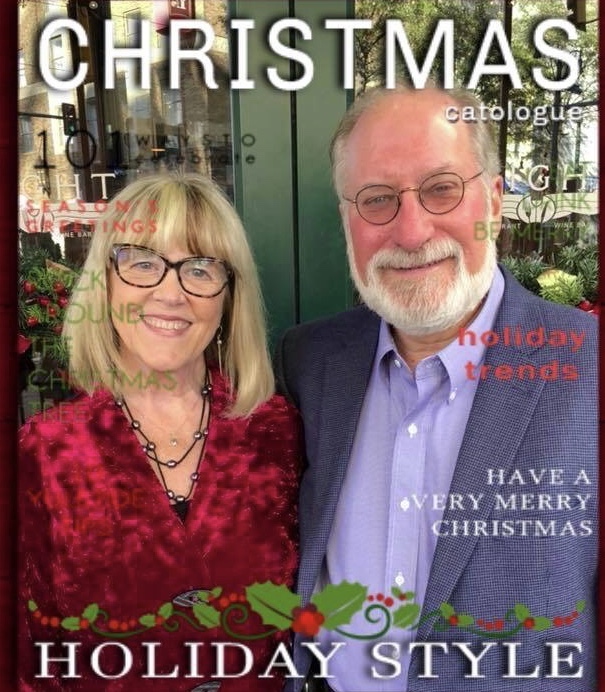 I’ll just send our Christmas card to all of my readers, and thank you so much for reading, for commenting, for friending me on Facebook and following me on Twitter. I’ll be back next week! I’d like to mention that it’s also been a banner year for William Cushman, who, among other honors, received the 2017 Inter-American Society of Hypertension Lifetime Achievement Award, in recognition of scientific contributions that have substantially influenced the field of hypertension across the American continents. He received the award at the group’s meeting in April in Argentina. His achievements were too many to mention on our Christmas card, but I’m so proud of him. You can read more here. 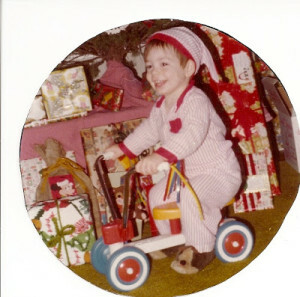 Me on our spinning wheel with my Chatty Cathy doll, circa 1961. 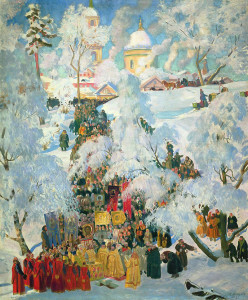 Three years ago I did a post about Christmas stories, which has links to several entertaining stories and essays. 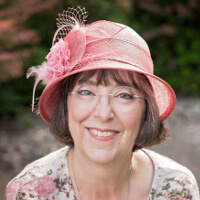 Today I’d like to share a wonderful story you can LISTEN TO HERE from a friend and writer who lives in Alabama, Kerry Madden. “Santa Secrets” is funny but also poignant. I hope you enjoy it as much as I did. My Aunt Barbara Jo and Uncle Dan and their kids, my first cousins Tommy and Amanda, were also a big part of my memories. We did Thanksgiving at their house for many years, but we also visited them at Christmas time (and they were often at our house) where my favorite memory is my Uncle Dan and my father singing “O Holy Night.” Uncle Dan sang tenor in his church choir and Daddy was a baritone. 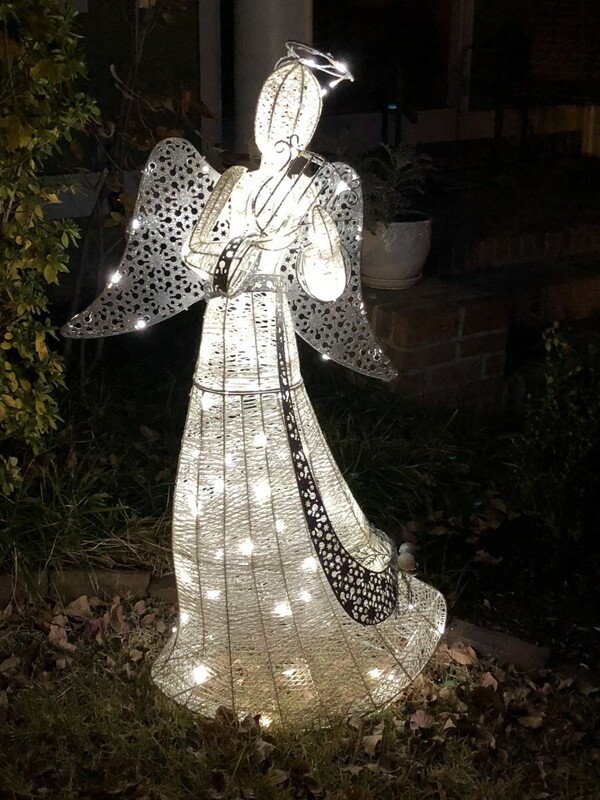 Last night as I watched Brooke Simpson, one of the contestants in the finale on “The Voice,” sing “O Holy Night,” it brought back the memory… and tears to my eyes. We did Santa Clause until my brother and I were around 7 or 8, I think… and I remember running into the living room to see the (unwrapped) gifts under the tree from Santa. Most of the smaller, wrapped gifts from our parents and others were clothes or small games. 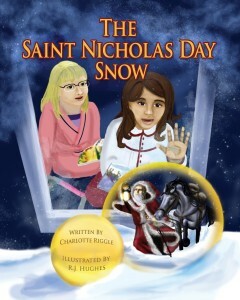 But Santa brought things like bicycles, life-size dolls, piano keyboards, and sports equipment. 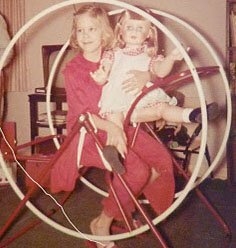 A favorite gift was this whirly-gig thing you sat in, tucked your feet under the seat, and spun around and around like a hamster. The picture at the top of the post is me sitting on it, holding my Chatty Cathy doll, around 1961 or 1962. Of course Mike got bored with it eventually. One day he decided he could make it spin faster if he took a running leap into it, and he missed the seat and cracked his two upper front teeth on the floor. Another time he took it off its frame and road it down the street and crashed at the bottom of the hill. I’m sure the toy wouldn’t pass today’s safety requirements, but we loved it. If the spinning-wheel toy (can’t remember what it was called) was the favorite toy of my brother and me, I think that Omagles were probably the favorite childhood toy of our three children. They were giant plastic building pieces and wheels. Our kids made forts and stores and tents, and even this go-cart, which they could ride in. Hours of fun before they had computers and iPads and cell phones. Even before our first video game, Atari. And now Omagles are back! There’s an Omagles Facebook page, and you can buy them from Amazon! 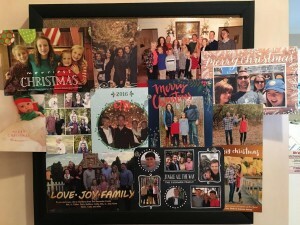 When I got married and we began to celebrate Christmas in our own home, especially once our three kids arrived, we started new traditions. One was hiding the Christmas pickle ornament in the tree after the kids went to bed on Christmas eve. They would come running in to find the pickle, and the finder got an extra gift. We continued this tradition even through their young adult years in college, and we’ve given pickle ornaments to our married kids, hoping they will continue the tradition with their own kids. Those are just a few memories. I’d love to hear some of yours… please share them in a comment here or on Facebook! We just watched three Christmas specials on TV this week, which always adds to my nostalgia for Christmas past. 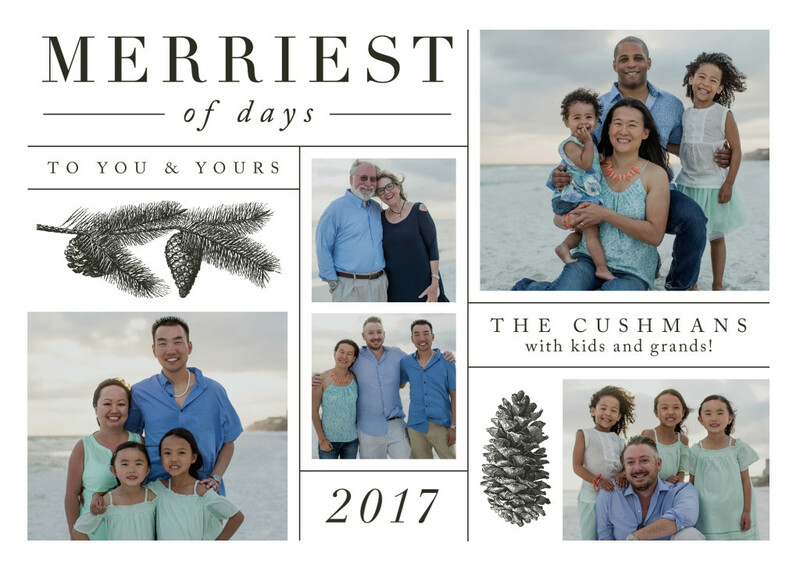 Growing up in a “dysfunctional” (I’m tired of that word, but it fits) family, I always loved holidays. My mother made each of them special—Christmas, Easter, even Halloween and Valentine’s Day. She would decorate the house and cook special treats and for a few days during each holiday season, all would feel right with the world. Even with our family. 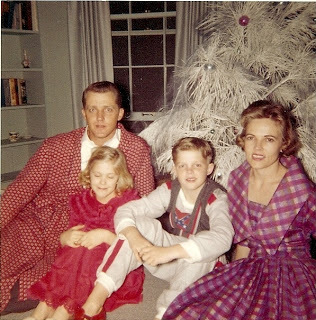 I know I’ve posted this before, but here’s my favorite Christmas photo—Christmas eve in Jackson, Mississippi, around 1959. I think we had been to church (or maybe Mom and Dad had been to a Christmas eve party?) and everyone but Mom had already changed into our jammies. 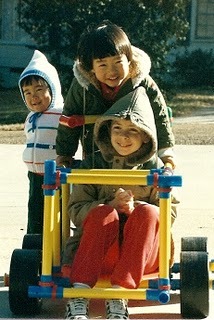 Today is my brother Mike’s birthday. He died in 2007 (ten years ago, wow) when he was only 58. Memory eternal, Mike! A favorite Christmas memory for me is wrapping gifts. 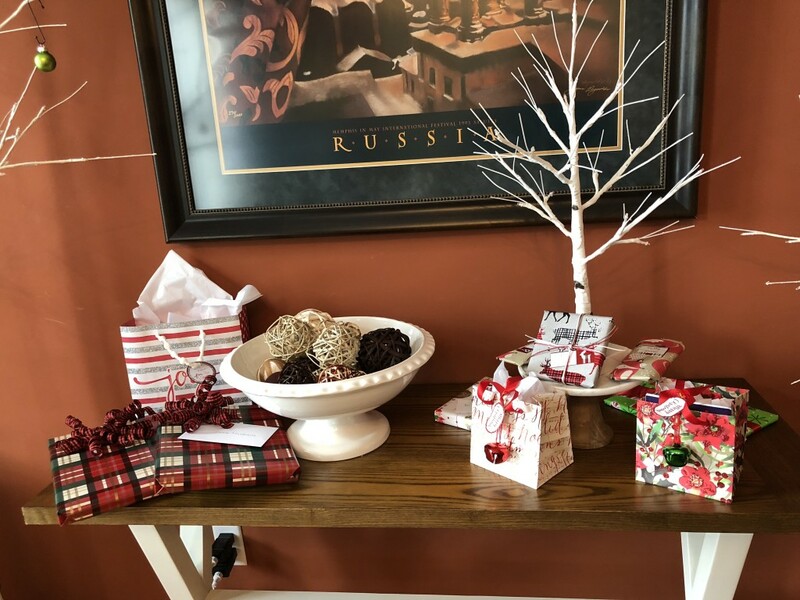 Mother would set up a gift-wrapping station—usually a long table—with lots of wonderful paper and ribbon and special crafty items. After watching her work her magic for several years, I was finally given the reins and allowed to wrap all the presents for our family (except for mine, of course). I would play Christmas music on the stereo and make a cup of hot chocolate and immerse myself in the world of gift-wrapping. That’s what I’ve been doing this week. My creations aren’t as fancy as the ones Mom and I used to make, mainly because I have to mail most of them and big bows don’t survive shipping very well. 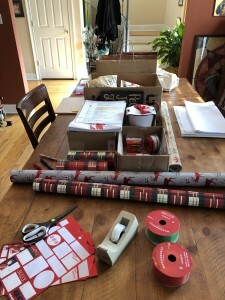 But I still love choosing paper and ribbons every year—this year I’m into red, black, and white, with lots of reindeer and Santas. 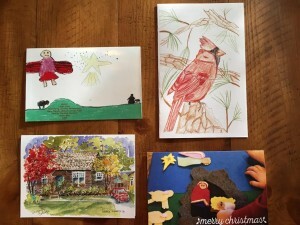 And beyond the joy of doing something creative, I love imagining each friend or child or grandchild or Godchild opening their gifts, and it fills me with joy. Yesterday I mailed 8 Christmas gifts to 6 different states. 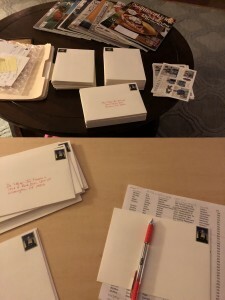 I also mailed 100 Christmas cards—another tradition I treasure. I often address and stamp my cards while watching those Christmas specials on TV, chasing that elusive Christmas atmosphere I am craving. We’ve been empty-nesters for sixteen years (hard to believe our youngest turned 35 yesterday!) and it seems I have to work harder to create that festive spirit without children in the house. 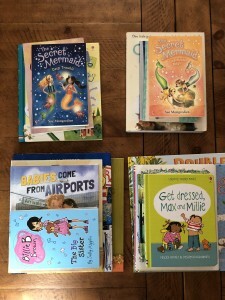 The granddaughters always get books, in addition to a special toy and Christmas jammies. And speaking of atmosphere, although I do most of my Christmas shopping online, I do enjoy being in stores at this time of the year—especially festive ones like Pier 1 and Macy’s. 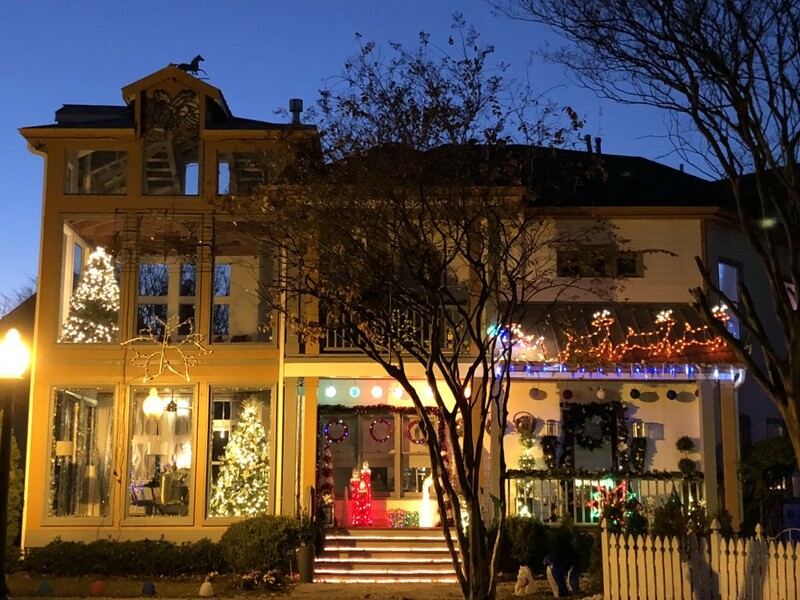 I participated whole-heartedly in Black Friday, Small Business Saturday, and Cyber Monday, ignoring the nay-sayers on Facebook who feel that these events tend to overly commercialize Christmas. I think they just make shopping more fun! 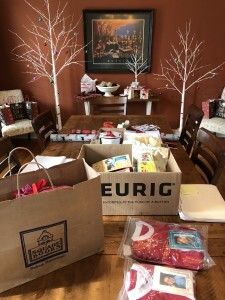 I’ve only got two more people to shop for, and several more packages to mail before our annual trip to Denver to spend Christmas (hopefully a white one!) with two of our kids and our four granddaughters. If it seems that I’m finishing up “early,” that’s intentional. Shipping gets more expensive (and the lines are longer) closer to Christmas. Also, I’ve got six book signings for Cherry Bomb this month (one in Memphis and five in different cities and towns in Mississippi) so I’m pacing myself. Tomorrow I’m off to Hattiesburg, Mississippi, to sign books at Books-a-Million, something I’ve never done. Afterwards, I’ll drive to Jackson to spend the night with friends who are hosting a literary salon for me Saturday night. 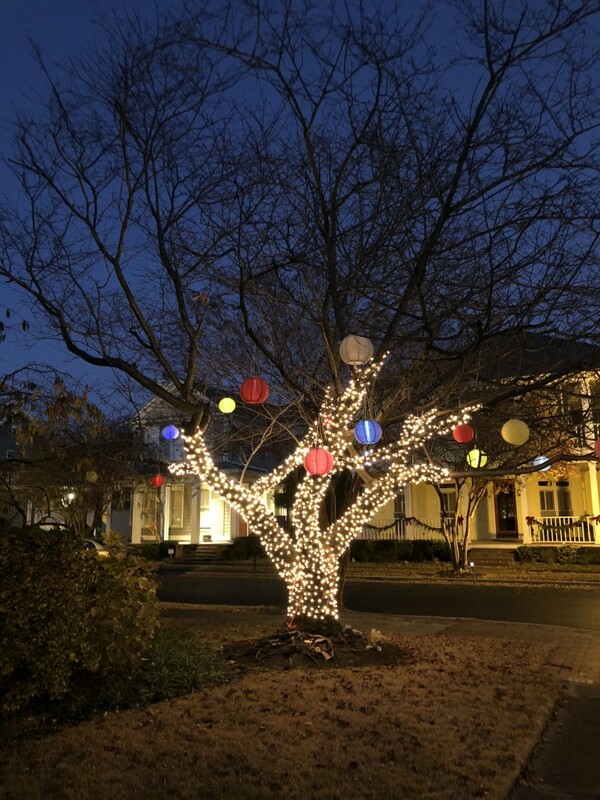 I’ll drive home Sunday in time for a friend’s book reading at Novel in Memphis, and for our neighborhood’s annual Christmas parade and tree-lighting, which happens right in front of our house, which faces “Christmas Tree Park” in Harbor Town. 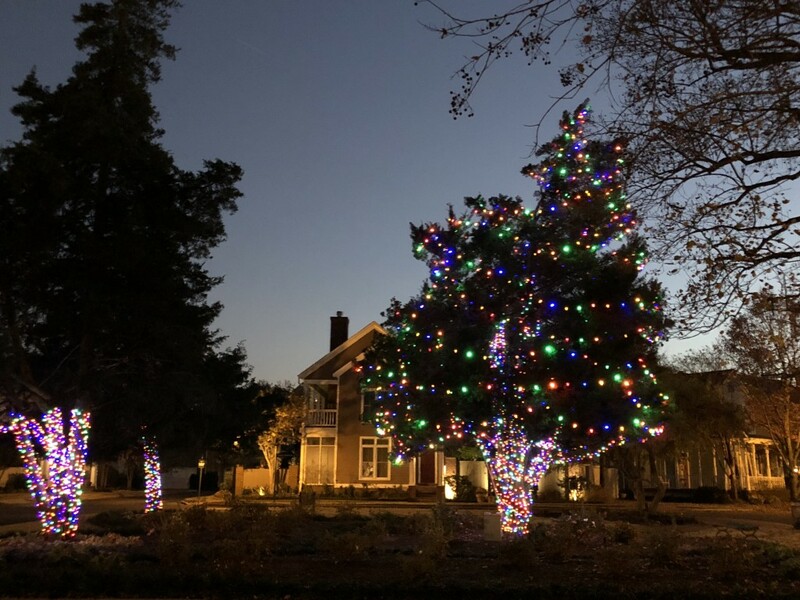 Enjoy the pictures from the park, our house, and a couple of neighbors’ homes at the end of this post. ’Tis the season, y’all! I hope you are enjoying it! 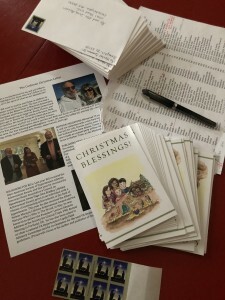 Stay tuned for posts of a more spiritual nature, as I write about our church’s annual St. Nicholas play, toys for the MIFA (Memphis Inter Faith Association) Christmas store, and Christmas caroling at a local nursing home. 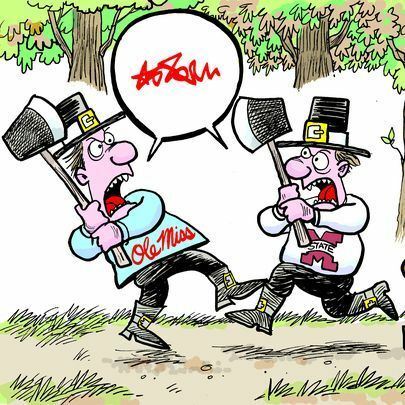 We’ll spend the remains of the day watching the “Egg Bowl” on TV. Go, Landsharks! 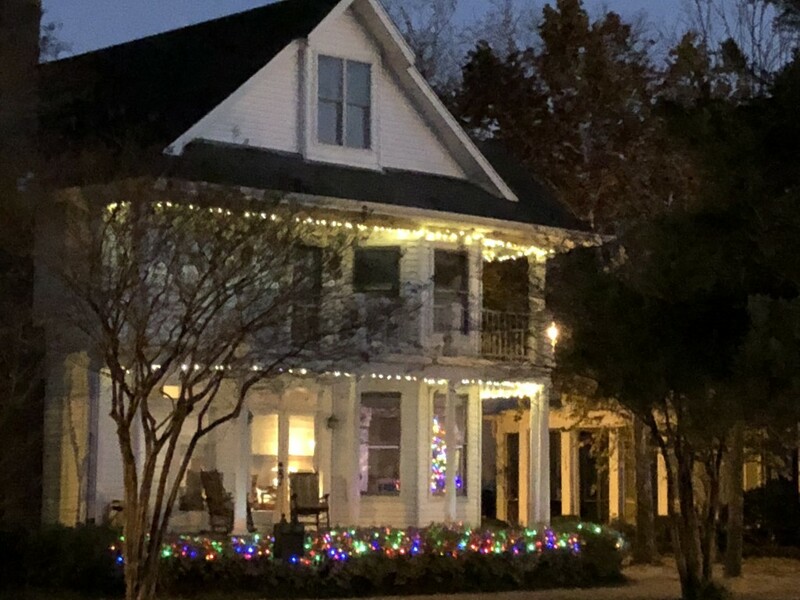 I just read through my Thanksgiving posts from the past few years, and also reminisced about my favorite Thanksgivings at my Aunt Barbara Jo and Uncle Dan’s home in Jackson, Mississippi. Barbara Jo’s famous cornbread dressing recipe is in one of the posts from 2014, below. Happy New Year! For my first blog post of the year, I’m simply going to share an amazing video. 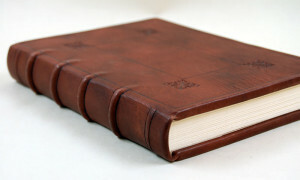 Grab a cup of coffee and WATCH THIS to see how books are made by hand, the old-fashioned way. And on this 9th day of Christmas, I offer you 9 ladies dancing. In church lore, they represent the nine fruits of the Holy Spirit: Charity, Joy, Peace, Patience [Forbearance], Goodness [Kindness], Mildness, Fidelity, Modesty, Continency [Chastity]. 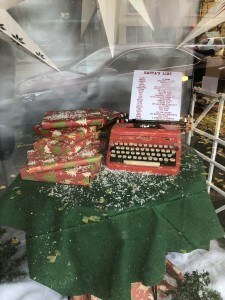 … my true love gave to me: four calling birds! 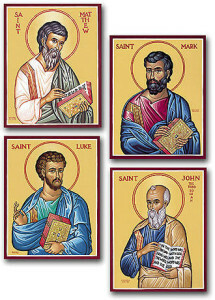 In the Church’s tradition, those birds represent the four gospel writers—the holy apostles Matthew, Mark, Luke, and John (seen in these icons). 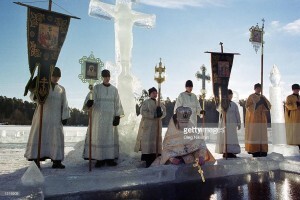 They are “calling” to the world to hear the message of Christ’s incarnation. 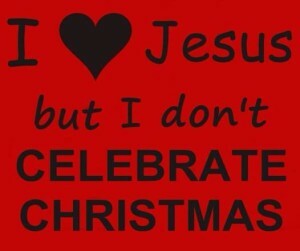 So how am I celebrating the fourth day of Christmas? 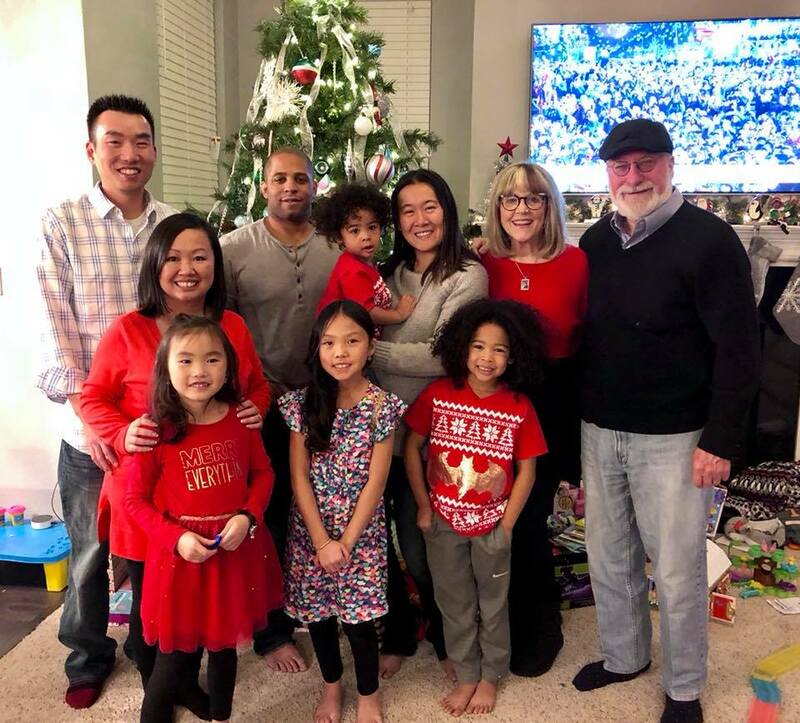 We just got home last night from spending a wonderful Christmas in Denver with two of our kids and all four of our grandchildren. So we are tired but happy. 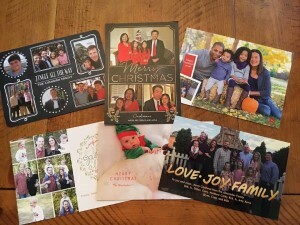 Of course I’m unpacking, doing laundry, and grocery shopping today (and starting back on exercising on the elliptical)… but it’s also a day for opening more Christmas cards and reading through so many wonderful Christmas letters from friends and family near and far. 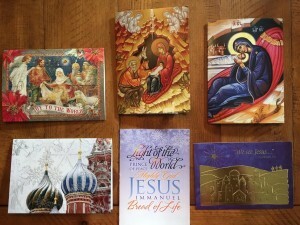 Sending Christmas cards is one of my favorite traditions, and receiving them is such a treat. kitchen bulletin board (with some of our 2016 photo cards) will stay up until next year’s cards arrive! 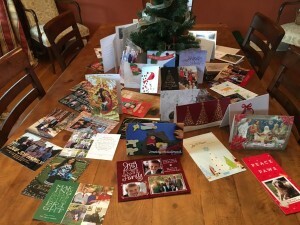 Thanks so much to everyone who was thoughtful enough to send us a card and/or a Christmas letter this year. I hope you are enjoying this tradition as much as we are!